They say great Aussie backyard is the thing in the past. It’s not true. We just forgot how to use it. Get together after the long day. Have a family meal outdoors – let your kids help lay the table. Create new rituals and little family events – with no particular reason, just for the joy of being together! How about a special outdoor movie night? Get your blankets and pillows, cuddle in camping chairs if you don’t own a formal outdoor furniture set, and invite your family to join you. Swap boring TV-time to a romantic evening under the stars. Watch a good old movie in your own backyard theatre. It is a bit more work than just turning your TV on, but still very easy to organise. Most importantly, such evenings are very memorable. Share with your children the movies you enjoyed as a child. Introduce them to the classics movies (check classification beforehand! ), or watch with them the record of your favourite band’s concert. All you need for your family backyard movie nights is a movie projector, a pair of speakers or a soundbar, and a movie screen. And you can even DIY – there’s plenty of information available on the internet on how to build your backyard cinema on cheap! Not everyone is a big fan of spending too much time stretching white sheets on your rotary washing line, or trying to choose the right projector on eBay. In this case, there are complete ready-made solutions available as well. 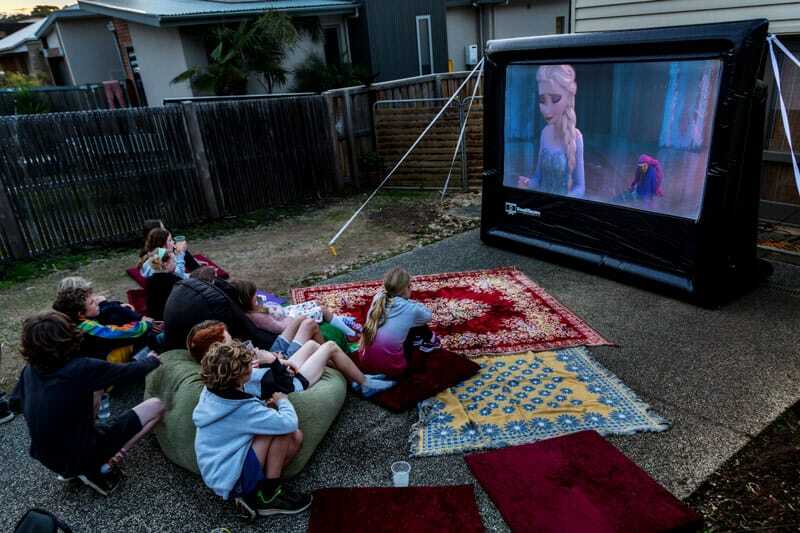 There are some affordable backyard cinema systems sold in Australia, offering portable and inflatable screens and projection systems. They make backyard entertainment easy. It is important to involve children in preparation of the movie night. While older kids can connect cables or set up your laptop, the younger ones should not stay aside. Turn the preparation for the movie night into a little game in itself. Ask your children to draw and “sell” movie tickets, decorate “movie theatre” and serve popcorn. They can even prepare a little performance on the “stage” prior to the movie! They say the backyards became smaller, but even a tiny patch of land can bring hours of happiness. You don’t need an acre of land to plant herbs and strawberries with your children, to have a BBQ, or to enjoy a water play. As for outdoor cinema, believe it or not, but you could have it in your driveway, in a garage, on a small backyard deck, or even on a big balcony! The most important is to spend quality time with your family, and to create special moments, whether they last minutes or hours. Small moments like that build a happy family. And backyard movie nights will create long lasting memories for you and your children. This article was originally published in November edition of MamaMag.